Approximately 2.5 hours southwest of Bangkok down the west coast of the Gulf of Thailand, The Hyatt Regency Hua Hin and its onsite spa are only a 20-minute taxi ride south from the Hua Hin International Airport. 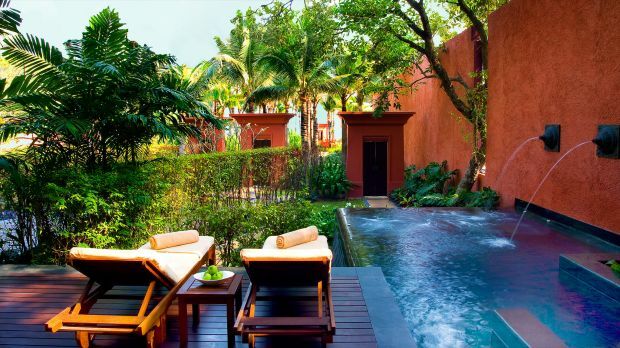 The Barai is an oasis of tranquility amidst jungle-thick, colorful gardens, sparkling pools, and soothing architectural design inspired by ancient Khmer culture. Turn off your cell phone and don't bring the kids; this is a place of where peace and quiet reigns supreme. As a unique residential spa, The Barai features suites designed to heighten your sense of tranquility and accommodate your treatments as conveniently as possible. Each of the large suites features garden verandas in ground-floor suites or spacious balconies with views of the Gulf of Thailand in upper-floor suites, as well as private areas and beds for treatments and massages. Choose from massage, skin, facial, or full-body treatments, each of which reflect the healing energy of one of four elements: water, fire, earth, or air. Beautify your extremities with Thai-therapy-inspired manicures and pedicures. Or, if you really can't relax completely, go sweat out some toxins in the fitness center. Send an availability request with your requested dates to the THE BARAI at Hyatt Regency Hua Hin.